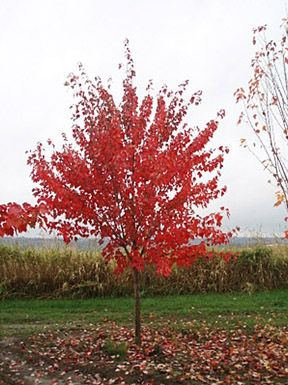 A recently planted tree can take up to two years or more to become established. An established tree will have roots that extend below the drip line, the area beneath the canopy where water from the tree drips into the ground. Taking care of a new tree is important. When a tree is planted or a tree transplant is done, it can lose some of its root system and go into shock for many months before it recovers. During this period, the tree is in a weakened state and more susceptible to pests and root disease. Even changes in the weather and soil can have an adverse effect on your new tree’s growth and health. After your tree has been planted, make sure you inspect it on a regular basis. Look for infestations from mites and bark beetles, and check for root disease. Take appropriate steps to handle these unwanted conditions before your tree is permanently damaged. Are you planting or transplanting trees that are young? Make sure the trunk has enough support by using stakes and other methods to keep it from bending. Newly planted trees will also need adequate water. How much water will depend on the size of the tree, the soil it has been planted in and how much it rains in your area. Mulching can help preserve water and protect the tree’s roots. It also prevents weed growth. New trees will also need to be pruned. Cutting away dead or overgrown branches will improve the tree’s ability to generate the energy it needs for growth. It will also increase its fullness. Fertilizing your tree is another way to improve your tree’s health and increase its growth rate. You can also use fertilizer to enhance nutrient deficient soil. Trees are an investment. If you want to plant or transplant a new tree, or move tree, we can help you select the right tree for your environment and show you how to care for it. Our big tree experts will make sure your investment continues to grow for years to come.